Receiving tenure, effective August 2016, at Prairie State College are (from left) Dr. Haiming Wang, assistant professor of physics and astronomy; Angela Simpson, assistant professor of nursing; Megan Hughes, assistant professor of reading/English; Annette Dolph, assistant professor of English; Elise Spencer, assistant professor of English; Dr. Hyrum LaTurner, assistant professor of humanities; Julie Wedster, assistant professor of surgical technology; and Lalinda De La Fuente, assistant professor of sociology. CHICAGO HEIGHTS–(ENEWSPF)–February 11, 2016. 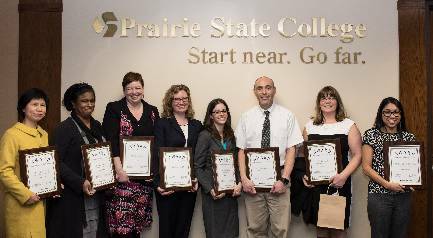 Prairie State College (PSC) recently announced that eight faculty members have met the college’s expectations for tenure, including commitment to student success, collaboration with their peers and dedication to the college’s mission and core values. Receiving tenure, effective August 2016, are Lalinda De La Fuente, assistant professor of sociology; Annette Dolph, assistant professor of English; Megan Hughes, assistant professor of reading/English; Dr. Hyrum LaTurner, assistant professor of humanities; Angela Simpson, assistant professor of nursing; Elise Spencer, assistant professor of English; Dr. Haiming Wang, assistant professor of physics and astronomy; and Julie Wedster, assistant professor of surgical technology. The faculty members were recognized during the recent Board of Trustees meeting, held Jan. 26. De La Fuente joined the PSC full-time faculty in 2013, after serving as an adjunct instructor for two years. She has a bachelor’s degree in communication/print journalism from Florida International University in Miami and a master’s degree in sociology from Roosevelt University in Chicago. At PSC, she serves on the Outcomes Assessment Committee, the International Committee and the Learning Communities Committee and is actively involved with the Drama Club. She also plans to launch a chapter of the Rotary Club during the spring semester. Dolph joined the PSC faculty in 2013. She has a bachelor’s degree in English and studio art with a minor in philosophy from Saint Mary’s College of Notre Dame in South Bend, Ind. and a master’s degree in English from Ball State University in Muncie, Ind. She currently is enrolled in a Ph.D. program in English at Ohio State University. At PSC, she serves as coordinator of the English Department’s portfolio assessment project and is a member of the Outcomes Committee. Hughes joined the PSC faculty in 2013. She has a bachelor’s degree in special education with a minor in English from Northeastern Illinois University and a master’s degree in education with a specialization in literacy, language and culture from the University of Illinois-Chicago (UIC). She currently is completing a Ph.D. program in the same area of specialization at UIC. LaTurner originally joined the PSC faculty in 2001. He served as chair of the Humanities Department from 2003 to 2008, and was advisor to the Philosophy Club and a member of the Technology Committee, before leaving PSC in 2008. He rejoined the faculty in 2013. He has an associate degree from Dixie Community College in St. George, Utah, a bachelor’s degree in communications with a minor in English and a master’s degree in English from Brigham Young University in Provo, Utah, and a Ph.D. from the Committee on the History of Culture at the University of Chicago. At PSC, he currently serves on the Curriculum Committee and the Faculty Development Committee. He also was instrumental in planning and coordinating the Philosophy Social Club. Simpson joined the PSC faculty in 2013. She has an associate degree in nursing from Kennedy-King College (City Colleges of Chicago) and a B.S.N. and M.S.N. degree from Lewis University. She holds professional licenses as a registered nurse in both Illinois and Indiana, and is certified in neonatal resuscitation, pediatric advance life support and basic life support. She is a member of the National Nurses United, Illinois Nursing Association, and the Academy of Neonatal Nurses. Spencer joined the PSC faculty in 2013. She has a bachelor’s degree in English from Averett University in Danville, Va. and a master’s degree in English literature from Loyola University in Chicago. At PSC, she is an active member of the English Department, serving on the Placement Committee. She created an English Pedagogy Reading Club, serves on the Faculty Senate and the General Education Outcomes Committee and this semester will begin serving as coordinator of the Writing Center. Wang joined the PSC faculty in 2011 as an adjunct instructor teaching both astronomy and physics courses. She began teaching full time in 2013. She has a bachelor’s degree in applied physics from Fudan University in Shanghai, China, and a master’s degree and Ph.D. in physics from the University of Tokyo, Japan. Before coming to PSC, Wang was a postdoctoral researcher at the Japan Atomic Energy Research Institute in Japan, worked as a research associate in the department of chemistry and the Enrico Fermi Institute at the University of Chicago, and has been guest faculty at the Chemical Sciences & Engineering Division at Argonne National Laboratories in Illinois since 2012. Wedster joined the PSC faculty in 2013. She has an associate degree and bachelor’s degree from the University of Phoenix. She also holds a certificate in surgical technology from PSC. She has more than 10 years of experience working in hospitals and medical centers, with experience in various areas of surgery, including plastic, burn, open heart, vascular and thoracic. She worked at the University of Chicago and St Francis Hospital as a surgical technologist and is a member of the Illinois State Assembly for the Association of Surgical Technologists. She has been instrumental in developing an associate in applied science degree in surgical technology at PSC, which will begin admitting students in the fall 2017 semester. Vice President of Academic Affairs and Dean of Faculty Dr. Marie Hansel, says the candidates were selected from a highly qualified pool of candidates during the hiring process, and were mentored and tested to fitness by the tenure process. Elements of the tenure process include review by a peer committee of tenured faculty, student evaluations, deans’ reviews, and classroom visits. Prior to being awarded tenure, the faculty candidates also prepare an extensive teaching portfolio.